You can always count on the Guthrie's annual production of A Christmas Carol* for perfectly satisfactory holiday entertainment. Charles Dickens' 1843 novella is such a classic story of gratitude, forgiveness, and appreciation for one's life and the people in it, that no matter how many times I see it, it never gets old. This is my ninth year in a row attending A Christmas Carol at the Guthrie, and while the core story is always the same, there are enough changes from year to year to keep me interested. Whether it's a new adaptation (by Crispin Whittel, which the Guthrie began using in 2010), new direction (this year by Joe Chvala of Flying Foot Forum, bringing his signature style of motion to the dance numbers and the way characters move around the stage), or new actors playing familiar roles (more on that later), every year brings a slight twist to a familiar and beloved story. 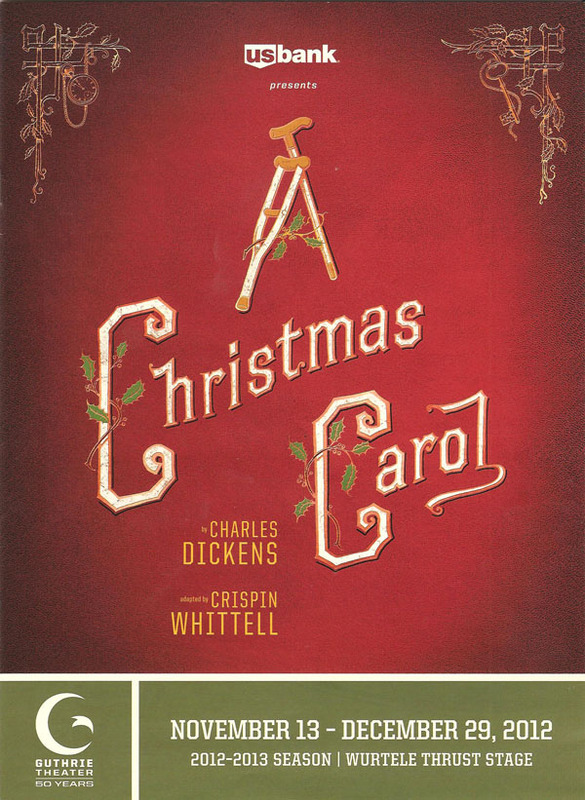 I spent some time this morning looking through my nine (and counting) scrapbooks full of ticket stubs and playbills, remembering past versions of A Christmas Carol. It was fun to see the revolving cast, with many constants returning year after year along with a few newbies every year. About two-thirds of last year's cast returns, with notable newcomers including Chanhassen fave Jay Albright (applying his entertainingly expressive face to the diverse roles of the jolly Mr. Fezziwig and the somber priest at the graveyard), the newly crowned Ivey Award-winner Hugh Kennedy (charming and natural as usual in the role of nephew Fred), and yet another graduate of the U of M/Guthrie program Paris Hunter Paul as young Scrooge. J.C. Cutler returns as Scrooge after his magnificent performance as artist Mark Rothko in Red at Park Square, his performance even more poignant and delightful than last year. Kris L. Nelson returns for the third year as Scrooge's hard-working clerk Cratchit, a likeable fellow who is eventually rewarded for his loyalty to the old Mr. Scrooge. Also returning for the third year is Angela Timbermann as Scrooge's housekeeper Merriweather, once again stealing scenes with her singing, drinking, and general disdain for everything. Returning ghosts include Tracey Maloney as the lovely but sad past, and Robert Berdahl as the merry present that turns much darker (also appearing as the boy Scrooge's literary friend Ali Baba and old Scrooge's fellow stingy businessman). But the award for longest tenure with the show has to go to Suzanne Warmanen as Mrs. Fezziwig. She has played the role in all but one of the nine productions I've see (I guess she was busy in 2009? ), and who knows how many years before that. She's got the role down pat, but continues to make it fresh and funny. Rounding out the cast are countless children and adults playing "rich men, poor men, carolers, Fezziwig guests, villagers, Londoners, and Morris dancers." The children are especially impressive as always, including the little darling playing the all important role of Tiny Tim, singing a beautifully clear and high carol so slowly and patiently while standing all alone on stage. Judging by these kids, the future of Twin Cities theater continues to look bright. My favorite scene in A Christmas Carol is always the Fezziwig party, or rather parties, as we see young Scrooge change over several years at the annual event held by his generous employer. Filled with music, dancing, food, and lots and lots of people, it always looks like the most wonderful party you've never been to. The dancing (choreographed by director Joe Chvala) is delightful, and everyone joins in. But this show is not all fun and games; the special effects involving the forlorn future shown to Scrooge are pretty creepy. Which makes the final transformation all the more satisfying. And it goes without saying that the sets and costumes are a feast for the eyes. If you've never seen the Guthrie's production of A Christmas Carol, it really is something you must experience at least once. And if the last time you saw it was prior to 2010 when they started using the darker, sharper, funnier adaptation with completely new sets, you'll probably want to see it again to see how much it's changed. Finally, if you're like me and you see it every year, rest assured that this year's production does not disappoint. Playing now through December 29. 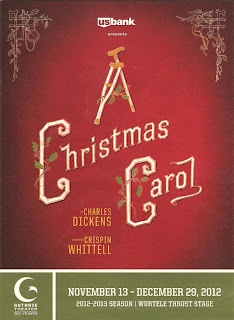 *I received two complementary tickets to A Christmas Carol as part of Blogger Night at the Guthrie.